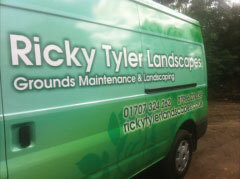 At Ricky Tyler Landscapes, we offer a complete grounds maintenance service to a wide range of clients throughout the UK. We look after school grounds, outdoor areas at commercial properties, retail parks, care homes, and council areas, as well as domestic and residential gardens. We can build a package that is tailored to suit each customer’s needs, and no job is too big – or too small – for our team of fully trained maintenance and landscaping staff, who take pride in delivering a first class service every time. At Ricky Tyler Landscapes, the customer’s needs always come first! Formed in 2002, we started out small, as a domestic garden maintenance company offering our services to customers mainly in the Potters Bar and Hertfordshire areas. Since then, as our reputation for reliability and great service has grown, the business has flourished and we have extended our range of services to include all aspects of landscaping and general grounds maintenance. Both are now a large part of our business, although we still look after individual gardens for our many loyal customers. Company founder Ricky Tyler remains very much at the forefront of the business and takes a hands-on approach to the various grounds maintenance projects, ably supported by a skilled and enthusiastic team. The focus is on delivering an excellent service every time; we ensure that all of our commercial and residential customers are happy with our work and can get the best out of the outdoor environment we help create and maintain on their behalf. With responsibility for the upkeep of the grounds at over 1,500 properties, our staff are highly visible in their uniforms and branded fleet vehicles. We adhere to a strict policy of providing our staff with all the training they need to meet the highest standards and use equipment and material safely at all times. Ricky Tyler Landscapes can provide gardening and grounds maintenance services including About Ricky Tyler Landscapes covering London, Essex, Hertfordshire, Northampton, Buckinginghamshire & Bedfordshire .